If you or a loved one is having a stroke, call 911 immediately! The UF Health Shands Comprehensive Stroke Center is certified by The Joint Commission and the American Stroke Association/American Heart Association. Comprehensive stroke center certification recognizes hospitals that have state-of-the-art infrastructure, experienced staff and extensive training to receive and treat people with simple and complex strokes. The UF Health Shands Comprehensive Stroke Center has been certified by The Joint Commission as a testament to meeting comprehensive stroke center standards and requirements, including advanced imaging capabilities, 24/7 availability of specialized treatments and staff with unique education and competency standards. The UF Health Shands Comprehensive Stroke Center is now part of an elite group of providers focused on quality stroke care. Comprehensive stroke centers are recognized as industry leaders and are responsible for setting the national agenda in expert stroke care. Patients who visit UF Health Neuromedicine Hospital will be met with a welcoming design, one that matches its inviting accessibility to highly specialized, comprehensive services. 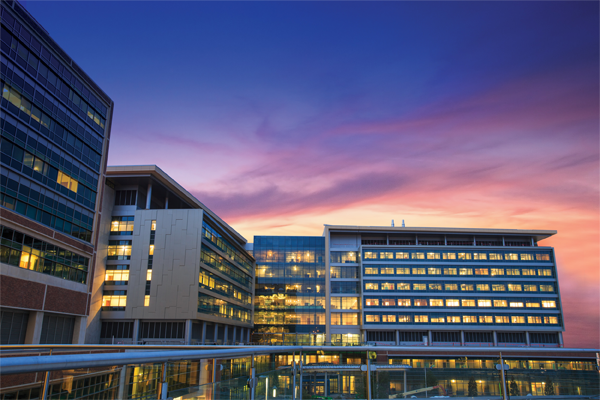 Our outstanding faculty physicians and clinical experts work in concert within a world-class medical facility to meet the unique needs of our patients. This makes UF Health Neuromedicine Hospital a one-stop shop for outpatient and inpatient treatment services. The Brain Attack Coalition established the concept of primary stroke centers and comprehensive stroke centers in 2000. Hospitals that demonstrate a high quality of care and good results for their stroke patients can become primary stroke centers. However, achieving a comprehensive stroke center designation requires the ability to provide more complex services, including minimally invasive catheter-based treatments for stroke and challenging neurosurgical procedures. While a primary stroke center must be able to treat patients with ischemic (blood vessel blockage) types of stroke using a clot-busting drug, a comprehensive stroke center must also be able to treat such patients with catheter-based procedures to remove blood clots, as well as provide neurosurgical services for the treatment of bleeding strokes. Comprehensive stroke center certification is provided through a partnership between the American Heart Association/American Stroke Association and The Joint Commission. UF Health is part of an elite group of hospitals raising the bar for stroke care. View the PDF comparing comprehensive stroke centers and primary stroke centers.